. Smallpox prevention in the Edo period . 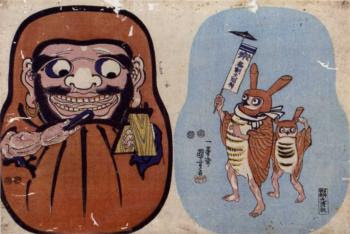 The Smallpox Deity comes clad in a red hood and red robes and looks like a child, or looking like an Amazake hag with the voice of a child. She knocks at doors. If anyone answers her call, he gets ill. To keep her away, a cedar leaf is placed in the doorway.
. Amazake babaa 甘酒婆 Amazake hag . 佐々良三八様御宿 - This is a dwelling of Sasara Sanpachi! 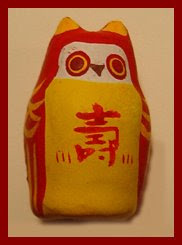 This kind of owl image and toy was used in the Edo period to ward off the smallpox.
. minwa 民話　folktales / densetsu 伝説　Japanese Legends .